A fascinating newspaper cutting has been unearthed in Manor Farm by Mark Bailey. It describes the first meeting of Plumtree Parish Council. Surprisingly, this links with today's Parish Council because the newspaper article was written by the current Parish Clerk, Mike Elliott. The photo and text are reproduced below. Plumtree's first parish councillors hand in their declarations of office before their inaugural meeting at Rushcliffe Borough Council chamber. Left to right: Mr Edward Phimister, Mr Peter Hopkinson, Mrs Elsie Gregory, Mrs Mavis Cockayne, the Mayor of Rushcliffe (Mr Horace Sanders), Mrs Almeria Bailey, Mrs Frances Filsell and Mr Anthony Cockayne. Plumtree's Magnificent Seven, the members of the village's first-ever parish council got down to business on Monday evening - for just over 20 minutes. That was all the time needed to rattle through the agenda for their inaugural meeting, which was held at the Rushcliffe Borough council chamber in West Bridgford. 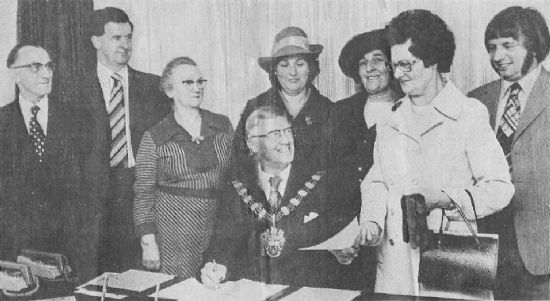 After signing their declarations of office, the councillors sat down to business watched by an audience of about 25 members of the public. The seven councillors are Mrs Almeria Bailey of Manor Farm, husband and wife Mr Anthony Cockayne and Mrs Mavis Cockayne of The Poplars, Mrs Frances Filsell of Station Road, borough councillor Mrs Elsie Gregory of Old Melton Road, Mr Peter Hopkinson of Plumtree Court and Mr Edward Phimister of Main Road. At the start, the meeting was chaired by the new Mayor of Rushcliffe, Mr Horace Sanders of West Bridgford. After asking the Rector of Plumtree, the Rev Norman Chadwick, to say a prayer, Mr Sanders got down to dealing with the first agenda item - his opening address. He said Plumtree's was the first new parish council since Rushcliffe came into being. In the 58 parishes of the borough, there were now 37 parish councils. The Mayor reminded the members that they had many duties to carry out, including that of levying a parish rate if required. A penny rate would raise about £250 - roughly equivalent to a £1 per head of the village's population, counting children. This was because Plumtree had one of the highest rateable values in the borough, he explained. The council would also be consulted on all planning applications. Mr Sanders said the members would gain many friends, but he warned that they could also lose a few if their decisions were unpopular. He emphasised that they were at the grass roots of local government. "You are the people who are nearest to the public. You are the people the public are going to contact first." Mr Sanders then moved on to item two, the appointment of a chairman, and invited nominations. Mr Phimister put forward the name of Mr Hopkinson, and this was seconded by Mrs Cockayne. The councillors had already had an informal get-together, and so it was no surprise that there were no more nominations. Mr Hopkinson was duly voted in, took the chair, and read and signed the declaration of office. He thanked the Mayor and promised that the new council would serve Plumtree to the best of their ability. He asked for nominations for vice-chairman, and Mrs Bailey proposed Mrs Gregory, the most experienced member. The seconder was Mrs Filsell, and Mrs Gregory was appointed. The next item was the appointment of a clerk, and the councillors approved the nomination of Mr Michael Mott, a solicitor, of The Park, Plumtree. Mr Hopkinson proposed the formation of two committees, finance and planning, on both of which the chairman would serve. He proposed - and it was approved - that the other members of the finance committee should be Mrs Cockayne, Mrs Filsell and Mrs Gregory, and that Mrs Bailey, Mr Cockayne and Mr Phimister should serve on the planning committee. Mr Hopkinson then asked if there was any other business, and Mrs Gregory asked if the clerk could prepare a list of organisations and bodies, such as the school managers, on which the council could be represented. This was agreed. The sixth and final item on the agenda was the date and venue of the next meeting, and the chairman said Mr Mott would notify members of these details. It is, in fact, planned to hold the meetings at the private Plumtree School. But Mr Hopkinson had a surprise up his sleeve. He asked the Mayor to present a silver tankard to Mr Chadwick, the rector, who for the past nine years had been chairman of Plumtree Parish Meeting, which is now superseded by the council. Finally, Mr Hopkinson read letters of congratulations to Plumtree from the neighbouring parish councils of Tollerton and Ruddington, from the Notts Association of Local Councils and from the Notts branch of the Society of Local Council Clerks. Mr Fred Kirk, Mrs Gregory's fellow representative for the area on Rushcliffe council, added his best wishes. Then, the meeting concluded, the councillors and the members of the public were given refreshments. The inaugural meeting of Plumtree Parish Council was held on Monday 23rd May 1977 in the Council Chamber of Rushcliffe Borough Council. Through Nottinghamshire Archives, we have obtained the agenda for the inaugural meeting and also a chairman's message which was circulated around the village a few months later exhorting members of the public to attend parish council meetings and listing contact information for the parish councillors. Prior to the establishment of Plumtree Parish Council, village events were transacted at the Plumtree Parish Meeting, which was established in December 1894 and dissolved in 1977. It is planned to put transcripts of the minutes of the Plumtree Parish Meeting on this website in the near future.